(R) indicates book review. - ? indicates that a copy is on file with year date but no indication of month. Minis Auto - Jan.79 - Jan.83. Vauxhall Craftsmans Guild - No.3. In November 1967 I left, after 17 years on the factory floor, a major engineering company in High Wycombe, Buckinghamshire, England, and started working for myself as a freelance Model Engineer, building film props, prototypes for Dinky & Corgi Toys, together with prototypes for a Birmingham fashion jeweller, before taking on a commission from Lord Montagu for two collections of model cars for the then Montagu Motor Museum (MMM). I had previous to this, built several ship models, and while building the first of the car models I also researched and finally built the 25 square foot model of Bucklers Hard, showing the village, ships and ship yard as it was in June 1803. This was also for Lord Montagu for his newly built Bucklers Hard Maritime Museum, on the Beaulieu River. This was followed by my first book, ‘The Techniques of Ship Modelling’ with an introduction by Lord Montagu. Two, the World Championship GP car each year. One of the points that I insisted on with regard to building the two model car collections, was that I should visit each car and collect the necessary data myself and draft my own scale plans for each individual model. This proved to be a good foundation for what followed, because it was not long before I was being asked to build a second model for the owners of the individual subjects, together with that for the MMM. The models for the MMM were to be built to the scale of 1/20 and to be without under body chassis detail, and with no engines, or opening doors or hoods. However it was not long before the collectors started to ask for this detail also, which I did not think very practical on so small a scale. So for the more detailed models I chose 1.15th scale, for no better reason than that it was between 1.20 and 1/10th scale, the latter, in my opinion, being to large for an artistic representation of a classic car, these being the subjects that seemed to be in demand. It turned out that 1/15th was not a regular scale to work in, 1/8 and 1/16th being more usual. However many years down the line, I came across several original drawings for the Bugatti Type 41 chassis, and was most pleased to find them drafted in 1.15th scale. From the start I chose as the aim of my work to try and capture the character of the subject rather than try to reproduce every minute detail of the entire car. No model car in anything less that a quarter scale can hope to show every detail to scale, if only because of the limitations of the materials. My philosophy is, that if you have to use licence, use it to show the character of the subject, rather than attempt to show irrelevant detail that will interfere with the the total subject. The eye expects to see certain things when it recognises an object. With something as large as a classic car, scaled down small enough to be held in one hand, unnecessary detail will distract the eye from the whole and more often than not kill the overall view of the subject, so that the essential character of the classic masterpieces will be lost. This of course is a very personal view, but if when one views the photos on my work in the ‘Car Collection’ and one could be mistaken for thinking that you were viewing a full size car, then I will have archived my aim. I add detail, which in most cases can be up to 95% of it, for the sole aim of making an artistic representation, in the round, of the subject I am dealing with. Another point that I made right from the start was to photograph each stage of the building of every model and particularly the finished model set in a natural background. As I had found no book at that time on the subject of scratch building model cars, and the ship modelling book had been a great success, my feelings were that there might be an opening for a book on the building of the cars as well. I later wrote and illustrated three, together with one on the lathe and milling machine work. As a consequence of an abundance of photographs of my work, very interesting subjects, and an increasing interest in my work from collectors and model makers in general, I started to write articles on each of the subjects and illustrate them with the photographs of the models. These proved so popular that I then started to get visits from leading journalists, both in the modelling field and in the field of full size classic cars, as well as Local and National Newspapers, such that on retirement, it appears that, on average, an article was published on this work every three month for over thirty years through 16 countries. being the Saunders Roe Princess flying boat from the 1950s. below is of the model featured in the article. 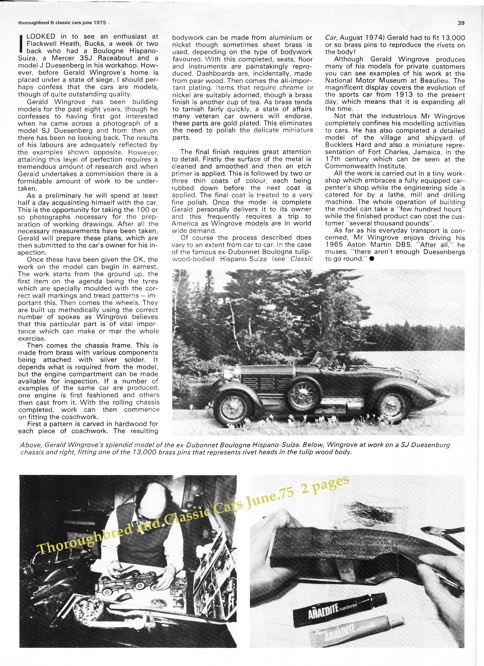 Thoroughbred and Classic Cars - June 1975 one of a two page article. 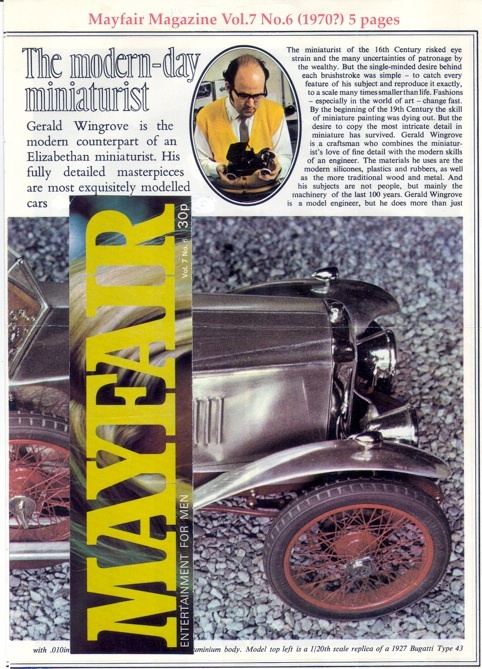 Mayfair Magazine Vol. - No.6 ( 1970?) one of a five page article. 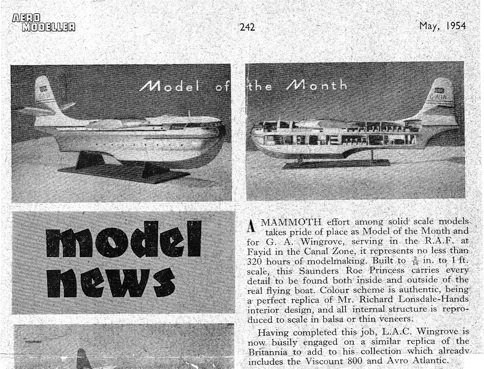 Aero Modeller May 1954 a short piece with photos.